In my Google spreadsheet, I have a column G of dates that interviews are/have been scheduled on. There is a validation set on it to validate for dates with a warning. Every once in a while, when someone was adding historical data but didn't know the right date they just put an x that the event has occurred (or cancelled if it was cancelled, or a variety of other non-blank statuses). But seem to be getting back any row for which G is not a valid date, not just where it is NULL. How do I make it ignore the validation? Not the answer you're looking for? 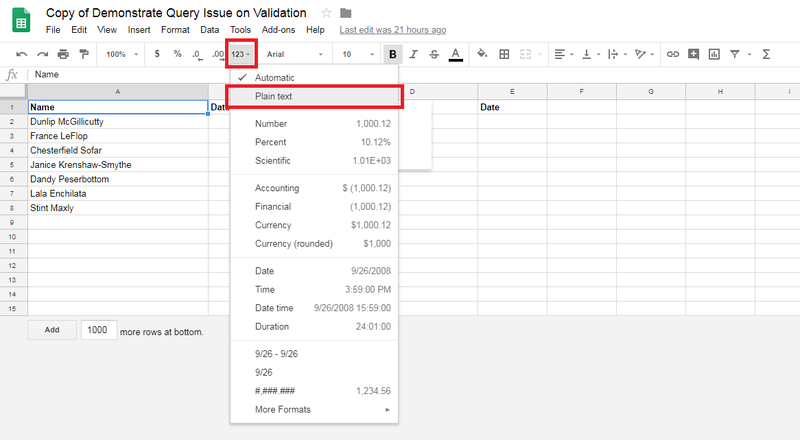 Browse other questions tagged google-sheets formulas google-sheets-query worksheet-function google-sheets-arrayformula or ask your own question.